This is the story of the IOD mould Classic Elements Mirror Refinishing. Recently I had to tell my boss “Don’t throw that mirror away!” We’re doing spring cleaning at the shop and anything that has been sitting around for too long waiting for someone to work on it, or paint it, or fix it, had to go through the discard scrutiny process. The mirror in question had once been very pretty with a beaded border and beveled glass. Sadly, it had been neglected and it needed help. The finish was drab. The beaded edge was missing several pieces and some of it was coming up and needed to be re-glued. There was 2 splits in the wood frame on the front although it was still intact in the back. I may not always know how to get where I want to go with a piece of furniture but I knew this mirror had potential. The new IOD moulds had arrived the week before so I was sure one of the moulds would work on this mirror. 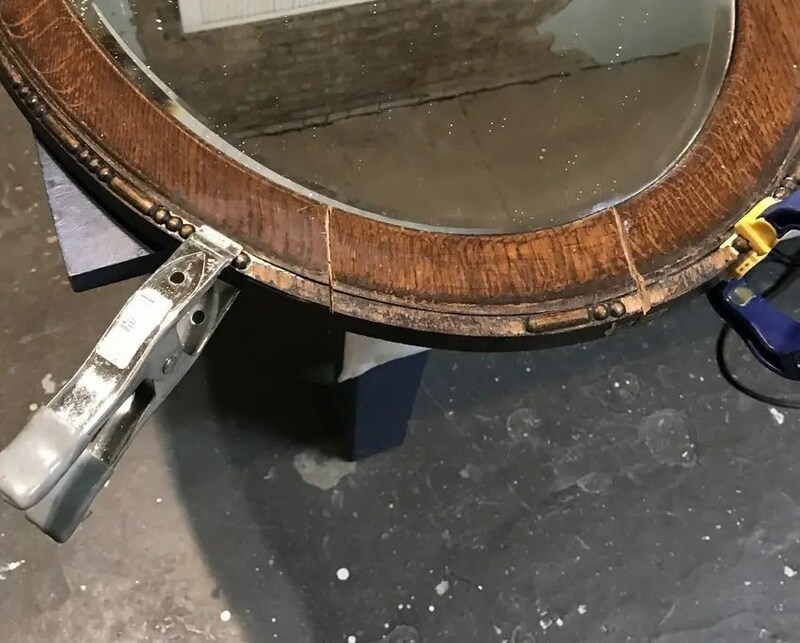 I had watched Handyman glue and clamp enough pieces over the years to know how to do that so I attacked the mirror one afternoon. I was sure I could make something beautiful in a couple of days. First step was to glue the beading that was coming up and clamp it so that it would go back to its oval shape. The next step was to replace all the trim that was missing with the bead trim from the Classic Elements Mould from IOD. The Classic Elements mould was perfect. 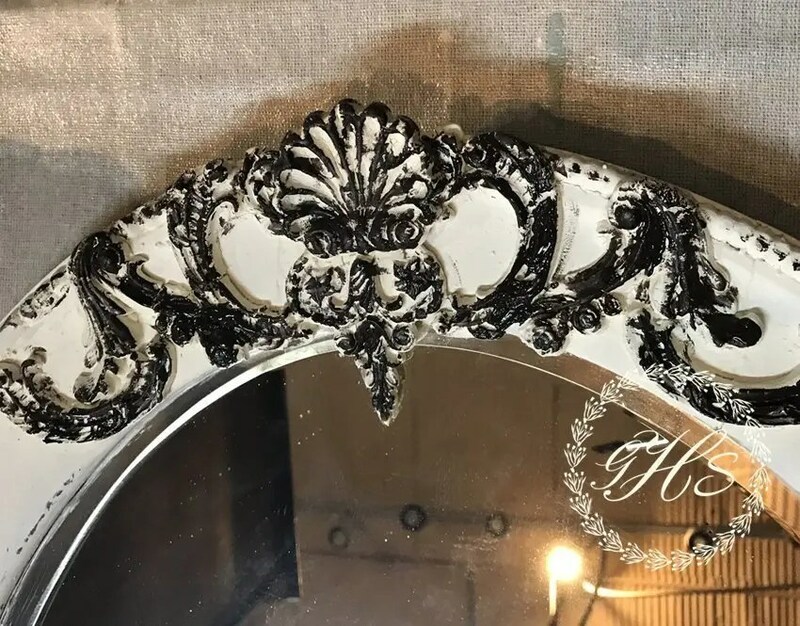 It has a beaded moulding and several large ornate parts that would take this mirror from drab to fabulously gorgeous adding a little Victorian Elegance along the way. As you can see by this photo the frame was a brown wood with little luster or interest left. Once I had the beaded trim glued on to the frame, I let it sit overnight to dry. I’m using this mould on two pieces that I am in the process of refinishing. This mirror is one and the other one is a china cabinet.The China Cabinet will be a tutorial for next week. The above gallery shows the steps taken to get the mirror in shape. After all the beaded moulding dried, I painted the entire piece with MMSMP in farmhouse white because I had some already mixed from another project and it was getting a bit too thick to save any longer. It is the perfect color for the IOD Mould Classic Elements Mirror Refinishing. All of the moulding on the top of this mirror is from the Classic Elements Mould. It was made with air-dry clay and then glued to the frame with carpenters glue. It was pieced and layered following designs I found on antique mirrors via Pinterest. 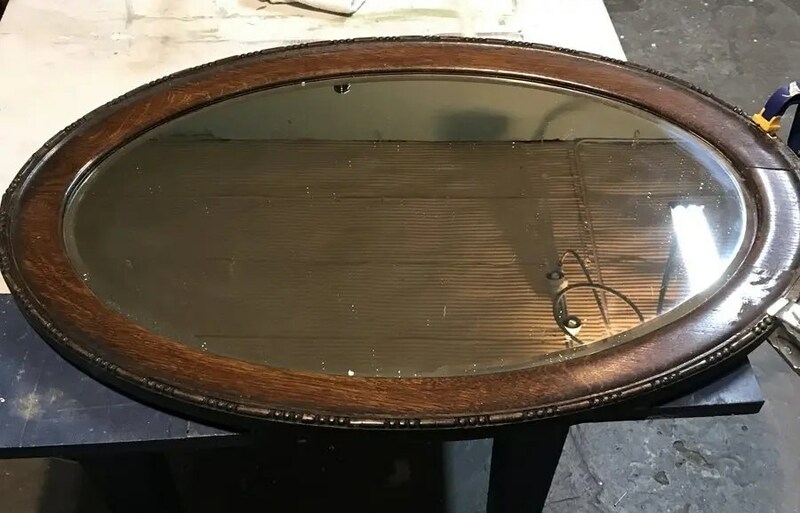 Once the clay dried, I painted the high spots dark brown so that after the final coat of white paint I would be able to distress back to some brown like the rest of the mirror. [Close enough anyway] The next step was a final coat of white paint over the mould design and anywhere else that needed it. Let the white paint mostly dry and then take a damp rag and wet distress the high spots to show just bit of the brown underneath. Finish off with MMSMP furniture wax to seal and protect. 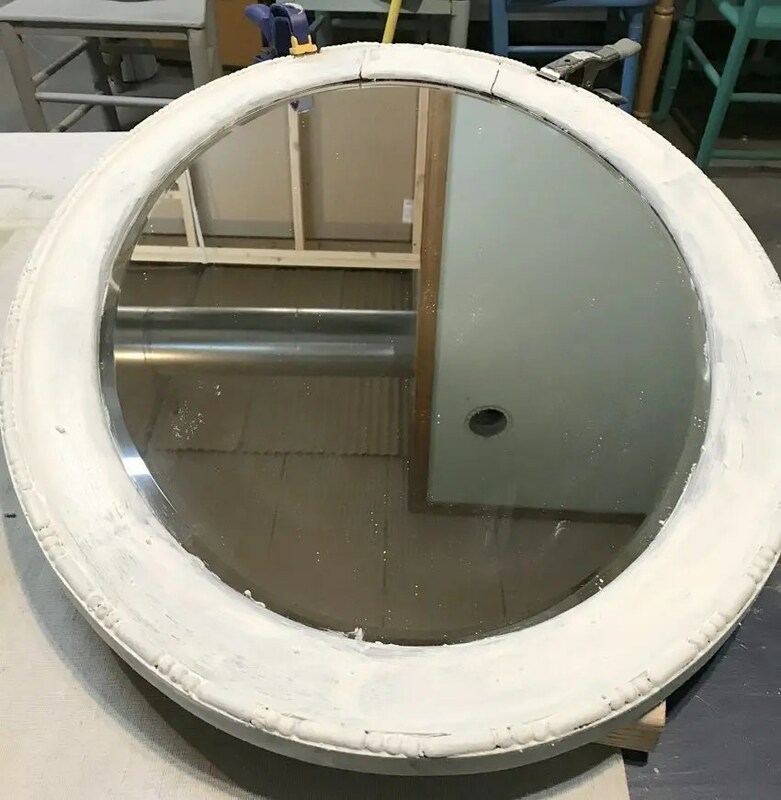 The IOD Mould Classic Elements Mirror Refinishing is done! Love how it turned out, really a big change and I’m so glad my boss didn’t throw it away! Trash to Treasure for the win! This really is more of an overview than a tutorial but if you have any questions about how we did any of the mirror just drop me a line. I love to hear from readers. More of our Amazing Moulds!